So due to things happening, I'm taking things easy at the minute. A schedule may happen or posts may go up randomly but I'm not that sure yet but as I have a good few posts that were meant to go up a while ago, I thought I would try and get them up as soon as possible. When I went down to London, I bought some chocolate from Whole Foods and I thought I would do a review all about it as it's different and it might be something that seems interesting. The chocolate that I chose after uhming and ahhing for a good ten or so minutes was a Dark Chocolate with Lavender bar from Seed and Bean. Seed and Bean was created in 2005. The company's aim is to create an ethical range of confectionery (fair trade, organic, friendly to the world.) Seed and Bean have a variety of flavours out which are there to interest and slightly shock you. They're in a few places including Selfridges and Whole Foods. They also do other flavours such as Lemon & Cardamom, Coconut & Raspberry and Chilli & Lime. I picked out the lavender chocolate mainly due to its colourful vibrant packaging but also due to the fact that I like the scent of Lavender so in theory before purchasing I knew I was going to like it. The other reasons that I mainly bought it was due to the ethical organic label on the packaging but also because it said vegan on it. I'm not one of those Vegan preachers as I eat meat but I have veggie days when I can and stuff but when it comes to chocolate Vegan seals the deal for me and the reason why is because vegan means that there is no lactose within the bar thus making it something that I can eat and not worry about afterwards. I had also only tried vegan chocolate in the form of cacao nibs which are raw chocolate so I wanted to see the difference between that and a bar. 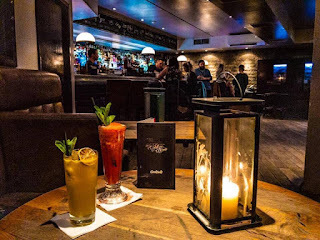 I eventually went home the same day and later on in the week decided to open the bar. The bright packaging smelt strongly of lavender. When I eventually got into the chocolate, I snapped a row off and ate it. 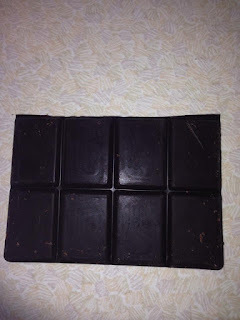 The dark chocolate which was slightly bitter worked quite well with the sweet floral like lavender and created an interesting bar which made me ooh and aah at the beginning because it was different. When I do buy chocolate I like to stick to old favourites which means the most interesting I get is Salted Caramel so having a floral ingredient which is used to help you relax within confectionery was different. I also used a bit of it within a hot chocolate. I just put a few chunks into a mug of warm chocolate oat milk. Warm chocolate oat milk is great on its own but it just made it that little bit more elegant and soothing. 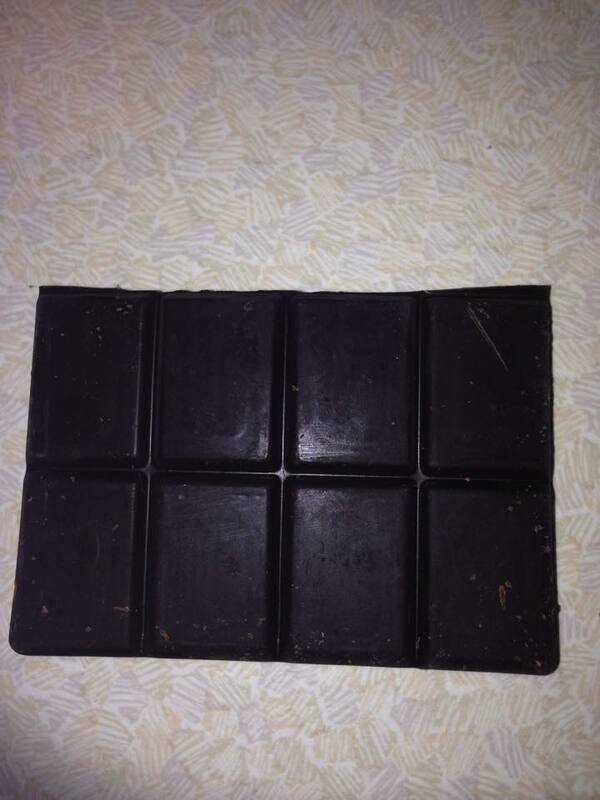 You can tell how natural the bar is just from looking at it. From the sheer on the chocolate showing that its got a high quality cocoa percentage to the smell confirming that it's natural. There is also flecks of the herb within the actual bar which tells you exactly what you're eating! I would give this a 9 out of 10. It's quite strong so if you're not a fan of dark chocolate or lavender then it will either not be up your street or may take a while to eat if you've purchased it. Seed and Bean do other flavours and some milk chocolate bars so there is a bar for everyone. The lavender is quite relaxing so I'd try and enjoy it at its best when you're relaxing after work or at night etc. It's one of those bars that you indulge in but you learn about whilst you're eating it. I'll hopefully enjoy this one again if I can get my hands on to give to someone as a present as I know some people who would love Lavender Chocolate or I'll try one of the other interesting flavours. I hope you've enjoyed this blog post and I hope you try some of Seed and Bean's chocolate. If you do then let me know what you think about it. I hope to see you next time for another blog post!